I need some input from anyone who's got some expertise on aerodynamics. I've been looking at various bodykits with the goal of increasing front downforce in mind. Want something functionally-minded, but as this is my daily driver I don't want something *too* race-track ready (i.e. a big front-diffuser jutting out, getting caught on curbs and speedbumps and driveways). Now, is it just me, or does it seem like that section will cause the front end to lift, rather than hunker down? That was my thinking, anyway... so I dismissed it as just another kit that was putting style ahead of substance. So here's my question: is there some secret to the aerodynamics on the FR-S/ 86 body that makes this upward-deflection area a good idea? And if so, can somebody explain it to me why? Best I can come up with is that it might speed up air flowing under the car, therefore creating low-pressure and drawing the entire vehicle down. But if that's the case, would our cars need the under-panels that are present on the JDM model GT-Limiteds to make this effective? Do some research on flat underbody panels. It may yield valuable information for you that will help you with this. So you're saying that these, err... plow-sections? 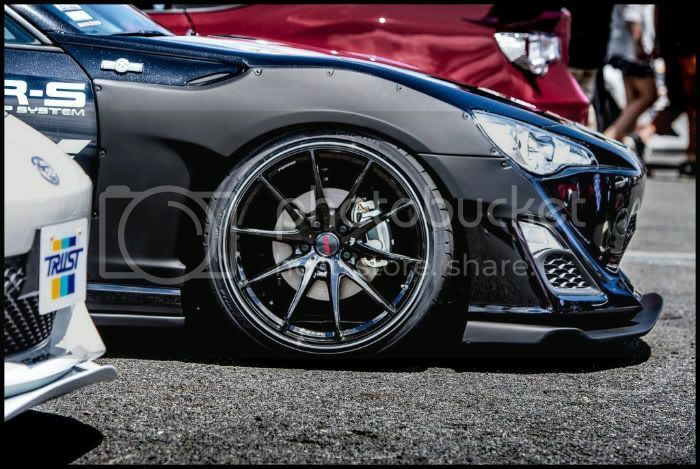 (don't know what else to call them)... on the front-lip kits smoothen out the air flowing under the car? Garage Revolution has a functional front lip for the 86. Given their presence in the WTAC, I don't doubt their claim that it actually works. Okay, so that's a fourth one using that sort of style, so there's got to be some very important reason behind it. Now, can anybody explain to me what that is? Cause my brain keeps trying to tell me that's just going to result in front-end lift. Your best bet is going to be getting a front splitter with some canards. After that I would recommend a flat underbody - I believe you can now get that imported from Japan. Lastly, look into getting a diffuser. For all intensive purposes, the front splitter would be your best best on getting more downforce. Additionally, lowering the car also gives you more downforce, though it is not that substantial. Last edited by QFry; 10-22-2012 at 01:56 AM. As you assumed earlier, air will be moving faster underneath the car with correctly designed front lips and under body panels. Think of an airplane wing, or airfoil. Air moves faster on top of the wing and slower below. Slower air below, means higher pressure under the wing, thus causing lift. The intentions of the front lip and under panels is the exact opposite, thus creating higher pressure on top of the car which is your desired downforce. 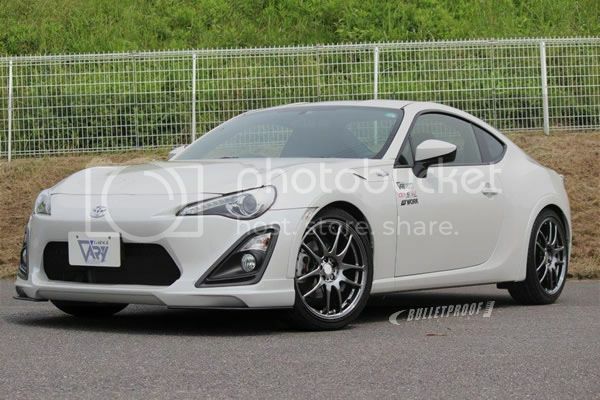 Okay... so it really isn't just a case of weird aesthetics; the folks designing these front lips actually DO know what they're doing, and its just the 86's particular aerodynamics that mean its more effective to have that little upturned center on the lip. Thanks for taking the time to explain all that! So you'd reckon that, for maximum effectiveness of the front-lip, I should go ahead and order the under-panels as well? Thanks guys! A million threads on suspension and exhaust mods, but aero gets treated like some sort of voodoo black magic on here. No problem , BUT i'm assuming not all aftermarket companies actually test their prototypes in wind tunnels, which can mean some may be purely aesthetic. IIRC, lengthening a body behind it's leading edge reduces the separation (of air flow) and should help with creating a more slip stream body.. So, by adding under body panels this should lengthen the surface of usable area behind the lip to prevent this phenomena from occuring. The Less turbulent air under the car means lower pressure underneath the car meaning your additional downforce. All of that air under the car looks like a bad idea to me. Air is going under there whether you like it or not. There is only so much air you can block/deflect. But, if you can speed it up you can use the air more effectively. Check out most supercars, lots of them have it too. The McLaren F1 was born in the wind tunnel. Gordon Murray wanted air to go down the middle. I vow to do no harm. 2013 Raven FR-S Manual "Lenore"